Before even going into this price analysis, it should be noted that this is in no way insisting that a price drop is imminent or that one will happen. Rather, the purpose of this price analysis is meant to be a friendly reminder that it could happen and that a consolidation period after a precipitous drop like the one that Bitcoin has experienced over the last 48 or so hours does not mean that a bounce is in the works. So, with that said, let’s take a look at some charts. While a -12% (approx.) drop isn’t unprecedented, when considering the total drop in price, it’s pretty astronomical. 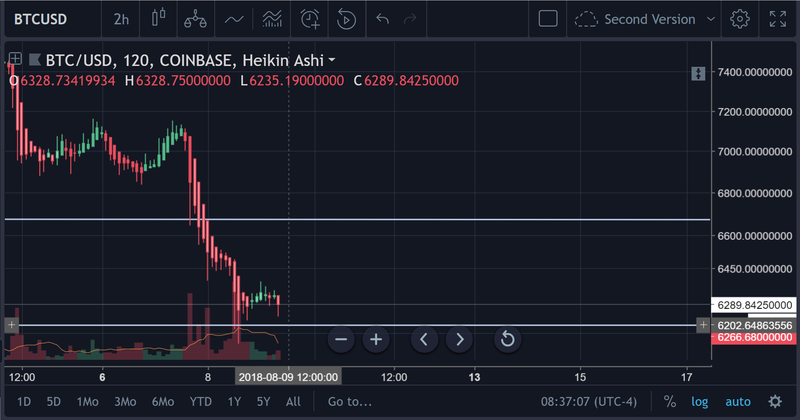 Above is a picture of the total drop from $8.2k to now, which has taken approximately two weeks to transpire to this point. What many many have noticed, however, is that there is a consolidation around a relatively firm support point. 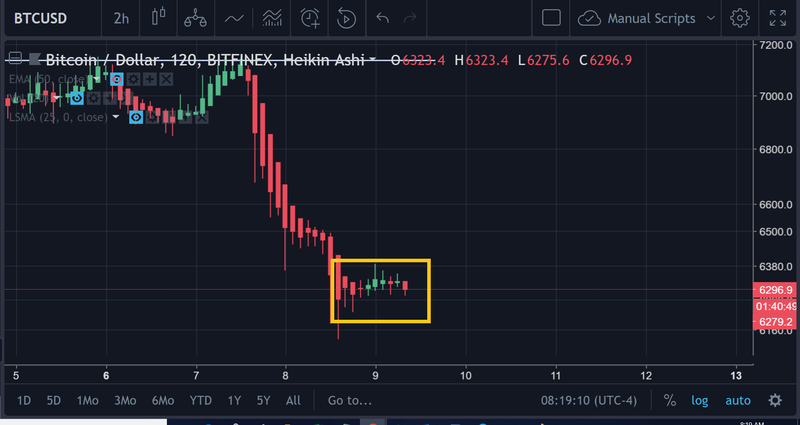 Above, you can see the consolidation of the price at the $6.2k price range. Let it be noted, by the way, that when we mention that something is a “support” or a “resistance”, the value is not exact. It’s generally a “zone”. This could be a measured move down. The measured move downward is similar to a bear flag and in a lot of respects its the same. However, bear flags typically involve a consolidation that is slightly upward and rarely is the ‘flagpole’ as precipitous a decline as what you see in the price of Bitcoin at this very moment. 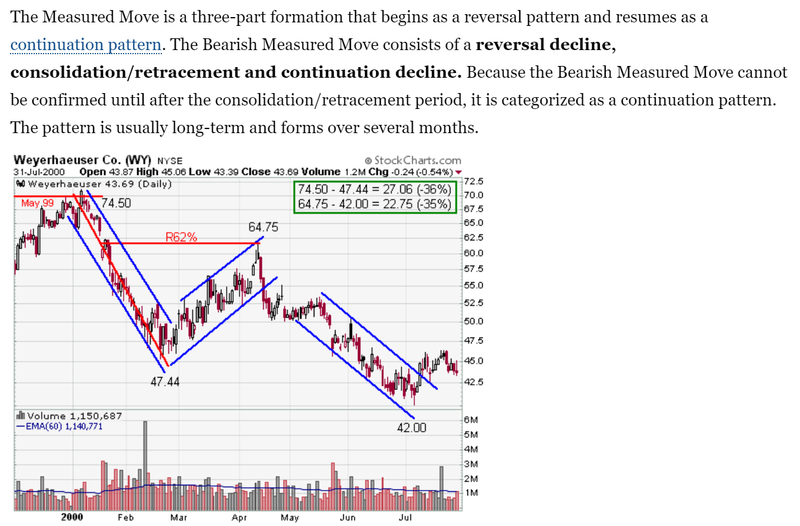 Here’s how you would calculate the completion of a ‘measured move’ pattern. 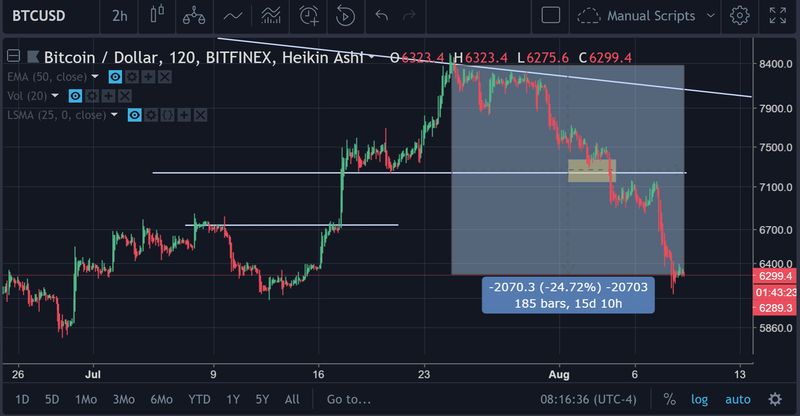 In this case, the point of the breakout would be just below the price itself, presumably at or around $6.2k — possibly $6.1k. 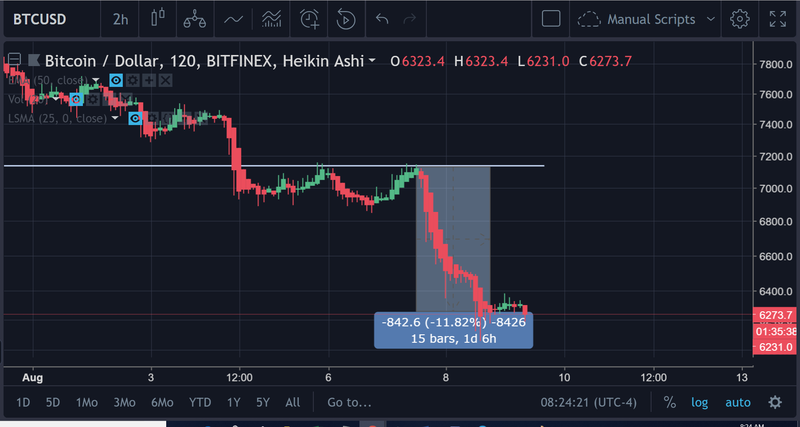 The distance of the flag was measured via the TradingView price action tool as $842.60. What was written above is not to be asserted as an inevitability. There is a possibility that the price moves upward from the level that it’s at. This is difficult to ascertain at the moment because of the ambiguity in the price consolidation. It has been resting at that support zone without granting any symptoms of divergence on the RSI for the higher time frames. There is some divergence on the 2H. 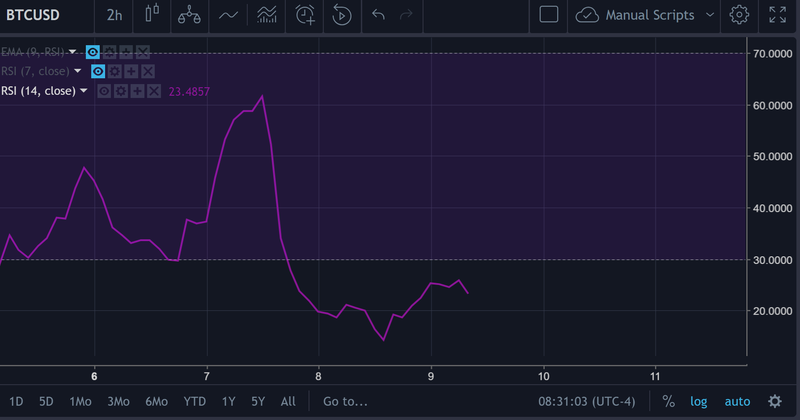 The RSI is headed on its way down and could easily reach as low as the first low on this chart before making another bounce, so traders should be warned. Currently, at an RSI valuation of 24, there’s plenty of room for it to drop. 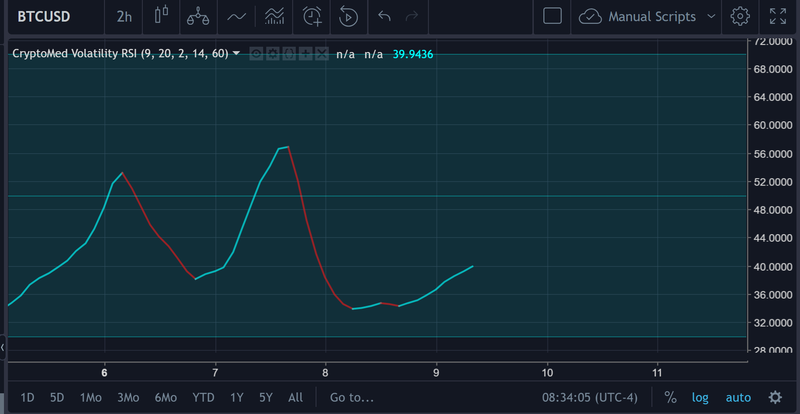 The volatility RSI has been heading upward. The volatility is headed up as well on the chart — which is somethign else worth noting. Interestingly enough, the Balance of Power appears to indicate a strong increasing sentiment. It has been on the increase. The lower support = $6,185, if you want something close to an ‘exact’. There is a potential of a re-test before there is a move upward, which could create a potential double-bottom pattern. 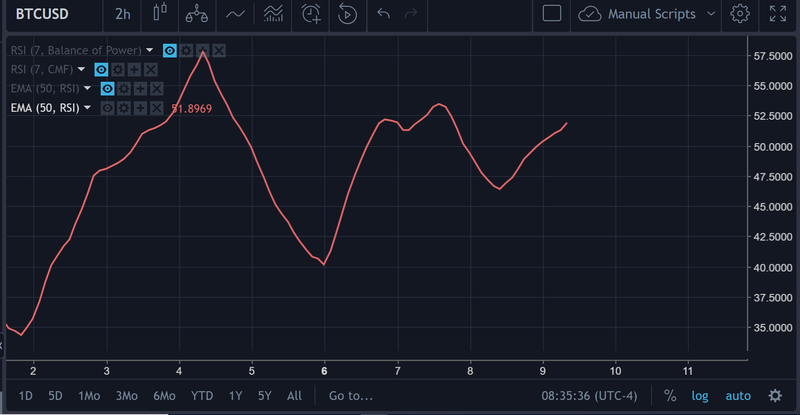 Bitcoin Price Analysis: $8.2k in Reach?